It takes two... This is a session on teamwork (not on relationships, although you can apply this to relationships and marriage etc!). To make things more fun we've added in a theme for the session with some random things thrown in throughout! The theme is Soul and Motown which you'll need to let the young people know in advance so they can come along dressed up as much as they can / like in the Motown Soul theme! You will really need to push this in the weeks before so that they make the effort! We've done a flyer for the evening which you can use and fill in with your own details! Ideas include playing some Motown music in the background / having pizza / having a few pictures around the room of soul and Motown (or on the projector) / hot dogs with mustard / ginger ale to drink. Pizza will be useful for the final section of the talk and response! There are loads of places in the Bible where people are sent out in twos and where God tells us how amazing it is to be in a team. In Luke 10, Jesus sent the disciples out and told them they had authority to heal the sick and say that the Kingdom of God was here. They were preparing the way for Jesus, going out and doing miracles seeing people healed and delivered from the evil influence of the devil. Jesus gave his disciples the authority to overcome the power of the devil and to bring God's life instead. Jesus was using this message of healing and setting people free as a way of testifying about who Jesus was and his power to save people and to set them free from evil. This shows us that God is good and that it is his will to heal, set the captives free and to release them from everything bad that holds them down. Jesus came to this world to set people free from sin, to release them, to show God the Father to people (Jesus only did what he saw the Father in heaven doing) and to bring light into the darkness so that the evil works of the devil could be destroyed and replaced with good. And the amazing thing is that God has given us the same authority. We are the disciples of Jesus if we believe in him and follow him. Jesus told us in John 14.12 that whoever believes in him will do the things that Jesus did. So if we believe in Jesus then (because of Jesus in us through the Holy Spirit), we have power to do the same kinds of things that Jesus did. The idea for this is that the young people have to get into teams of two - three. The challenge will be to impersonate the dances shown in the following Motown mix video (use as many tracks as you like - each one seems to be broken down into 20-30 second clips of a number of songs). Each group has to be ready to jump to their feet to copy the dances done. Prizes for all - or for the best dance impersonations! Ecclesiastes 4.12 - Though one may be overpowered, two can defend themselves. A cord of three strands is not quickly broken. Deuteronomy 32.30 - How could one man chase a thousand, or two put ten thousand to flight, unless their Rock had sold them, unless the Lord had given them up? Amos 3.3 - Do two walk together unless they have agreed to do so? Matthew 18 tells us that when we agree together in prayer that God the Father will answer that prayer. He tells us that God's presence is with us when just 2-3 people get together in his name (so that's church, that's our small groups, our worship practice and the other things we do in church life). Amos 3.3 agrees with this, basically telling us that teamwork and agreeing on what we do is really important. Ecclesiastes tells us that there is an extra power when there are two people working together. Deuteronomy tells us two people together makes things even more powerful. It lets us know that one can fight off a thousand, but two can fight off ten thousand. You'd expect two people to just fight off 'two thousand' but instead of having double power, two working together in agreement have ten times the power of just one person! Just imagine the impact of our lives if we all worked together in our youth group, in our church or all the churches in our country together! Just imagine what God could do through us to change this world and to turn things around for good! The way we do this is to recognise we're all different but that we have the same purpose - to spread the Good News about Jesus and to work so that God's will and God's kingdom comes on the earth. What is that? 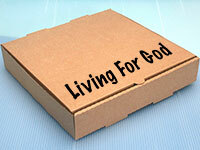 It is doing the will of God - it is obeying and living out the Bible - it is loving God and loving others. But we need to find another person or other people to work with us, support us, pray for us and help us! Pray before you eat the pizza and then encourage people to take lay their hands on each box before you eat (as far as is possible!). As you go around each box, pray for that thing and ask everyone to say Amen. So for example, "Lord we agree that we are going to live for you... Amen." Then move to the next box, lay hands and say, "Lord we commit to obey you... Amen." And so on! You can always do this with other food or in other ways!